Tonight marked the final home game of the season for the Pittsburgh Pirates and like they had done for most of the season at PNC Park, they closed it out with a win. The 5-3 win tonight also gave them a series sweep over the Baltimore Orioles and a season split, since Baltimore won both games at Camden Yards earlier this year. Pittsburgh jumped on the board early when Josh Bell hit a RBI single to left center to drive in Adam Frazier in the first. The Orioles would counter in their half of the second with three runs of their own off of Pirates starter Chad Kuhl. Chance Sisco would hit a RBI double to left center, J.J. Hardy brought in a run with a groundout, and Anthony Santander plated a run with a RBI double. As Clint Hurdle said last weekend, “we never win the offseason”. And just as it is every offseason, the Pittsburgh Pirates have fallen well behind other teams in terms of notable trades and acquisitions. This week, the Bucs made two signings to help compensate for the loss of Neil Walker. 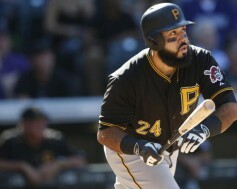 On Tuesday (officially announced Thursday), the Pirates re-signed Sean Rodriguez, and just yesterday, they announced a trade for corner infielder/outfielder Jason Rogers. 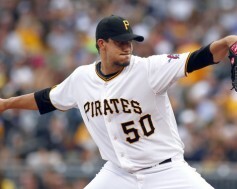 Compared to many teams in Major League Baseball, the Pittsburgh Pirates have been rather quiet so far this offseason. Still, as we all know, the Bucs have an agenda – to compete for the postseason and a division title by making cost-effective and smart baseball moves through trades and free agent acquisitions. Following the trade with the New York Mets which sent Neil Walker to the Big Apple for left handed starter Jon Niese, the Pirates still had some work to do before their lineup and rotation were ready for next season. The Pirates signing of right hander Juan Nicasio on Thursday brought some more depth to their bullpen for 2016. With rumors swirling at the Winter Meetings surrounding closer Mark Melancon, Nicasio joins the late inning group of Tony Watson and Arquimedes Caminero. Entering tonight’s Wild Card game at PNC Park, the odds were stacked pretty high against the Pittsburgh Pirates. Sure, they had come off an incredible regular season, but they were facing the hottest pitcher in baseball, Jake Arrieta and the Chicago Cubs. Even though the game was in Pittsburgh, the Cubs were known to be the favorite. Arrieta and the Cubs showed exactly why they were predicted to move on, as they blanked the Pirates 4-0 to advance to the National League Division Series. 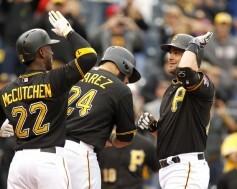 On the last day of the regular season, the Pittsburgh Pirates still had plenty to play for. A win today over the Cincinnati Reds meant that for the third straight year the National League Wild Card game would be played at PNC Park. After a 4-0 victory today, there will be a blackout along the banks of the Allegheny River on Wednesday night. The Pirates struck with offense in the first inning when Neil Walker hit an RBI single to right that scored Josh Harrison. That lead would double in the fourth inning when Pedro Alvarez blasted a solo home run to deep right center field and onto the riverwalk. Those two runs would send Cincinnati starter Josh Smith to the showers. He would pitch four innings allowing two runs on seven hits while striking out four batters. After a disappointing series against the St. Louis Cardinals, the pressure was on the Pittsburgh Pirates to finish the regular season strong against the Cincinnati Reds this weekend at PNC Park. The Chicago Cubs trailed the Bucs by just two games in the race to host the Wild Card game, but two victories this weekend would guarantee a Wednesday night showdown on the North Shore. The Reds and Pirates battled well into the night, and Starling Marte’s two-run homerun in the bottom of the 12th sent the home team to a 6-4 victory. With the win, the Pirates magic number to host the Wild Card game is down to just one. After Monday night’s 3-0 loss to the St. Louis Cardinals, the Pittsburgh Pirates’ chances at a division title looked awfully bleak. The Bucs needed to win the remaining five games of the regular season, including two against the Cards today, and St. Louis would need to lose four of their final five. Well, so far so good…the Pirates used the long ball against Michael Wacha on their way to an 8-2 victory over the Cards at PNC Park. Wacha was roughed up today, giving up six runs on four hits and four walks through four innings of work. His mound opponent, Gerrit Cole, was solid as always, giving up two runs on seven hits through seven innings of work. Prior to tonight’s game between the St. Louis Cardinals and Pittsburgh Pirates, it was believed by most that this was the biggest regular season series in the history of PNC Park. Unfortunately, the Bucs seemed to have buckled under the pressure of the spotlight, wasting numerous scoring opportunities and committing a costly error late, resulting in a 3-0 loss. The Bucs now trail the Cards by four games for the N.L. Central lead, and it makes the quest for the division title nearly impossible. The Pittsburgh Pirates entered this afternoon’s game against the Chicago Cubs at Wrigley Field three games back of the St. Louis Cardinals in the National League Central. In the middle of this crucial series against the Cubs, The Bucs turned to Francisco Liriano, who shut the Cubs down throughout the afternoon. 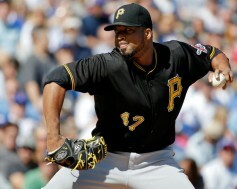 The Pirates got some good relief pitching and timely hitting, beating the Cubs 4-0 on the North Side of Chicago. After a 3-2 victory yesterday and a 4-0 win today, the Bucs have now won eight straight games, have extended their lead for the top Wild Card spot to 5.5 games and now trail the Cardinals by 2.5 games for the N.L. Central lead. After clinching a playoff spot last night, the Pittsburgh Pirates can now focus on their next goal of winning a division title. If they hope to have any chance of accomplishing this feat, they need to keep winning. 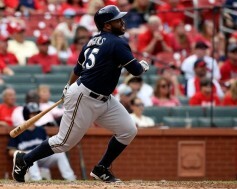 After defeating the Colorado Rockies today by the final of 5-4 they are keeping pace with a hot St. Louis Cardinals team. This would be a back and forth contest all day long. 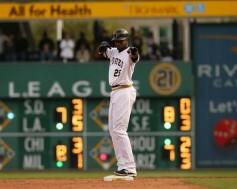 Pittsburgh was able to get on the board in the top of the first when Starling Marte hit a RBI single to left. 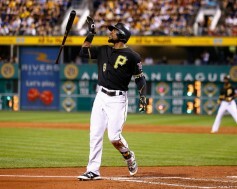 Marte has been on fire this series, he would go 4-5 today and bat .650 during this four game series with Colorado.